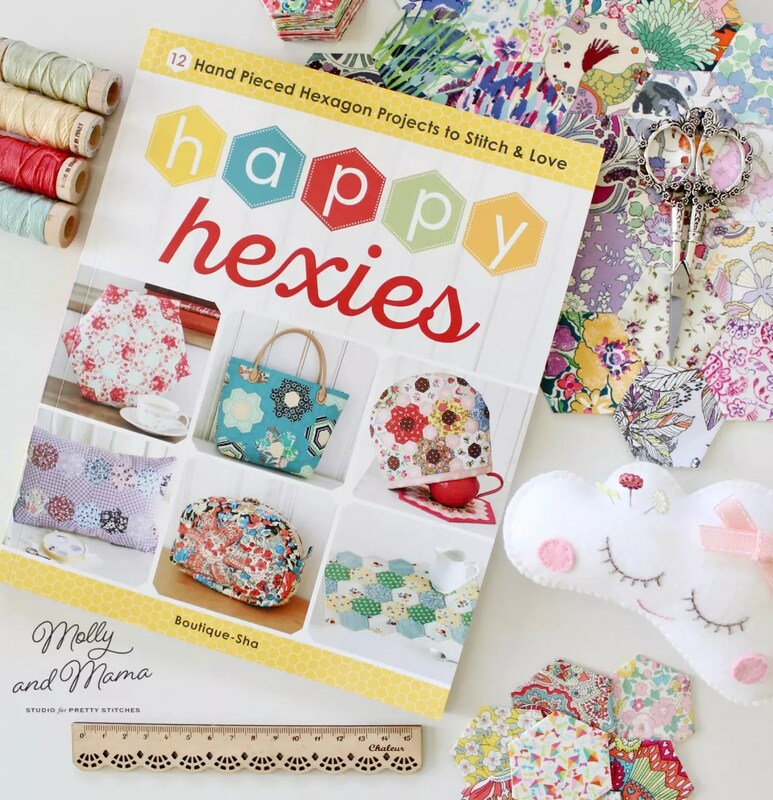 Happy Hexies is a beautiful new sewing book brought to you by Zakka Workshop. 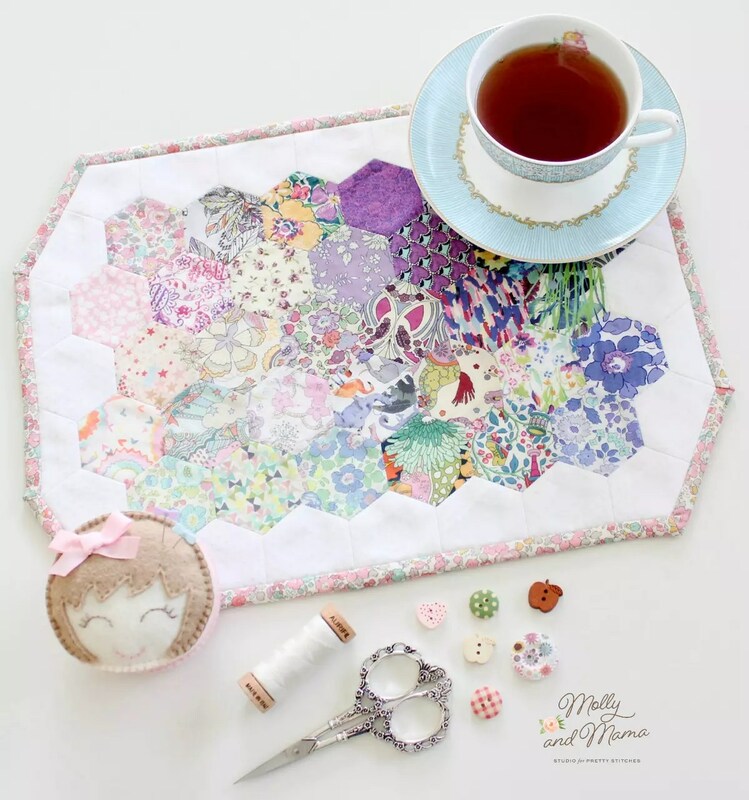 It features 12 hexie-inspired zakka projects that are quick to make and fun to sew. The team at Zakka Workshop very kindly sent me a copy of the book to play with. Even the cover is happy and fun, right? I love that the book teaches you two main methods for piecing; the English paper piecing method and hand piecing. I definitely learnt some new techniques when reading the detailed ‘Before You Begin’ section of the book. Each project is neatly laid out with a materials list, cutting instructions, clear step-by-step instructions and easy-to-understand illustrations. And there are plenty of inspiring photos too. I have to confess that I couldn’t stop looking at the pages until I decided on a project to sew! I loved the Confetti Coaster & Placemat set, however I didn’t have enough low volume fabrics to piece the centre panel (note to self – rectify that a.s.a.p!). However, I did have a Liberty hexie panel that I had already begun stitching and it just so happened that it was perfectly sized for the placemat project. So I used a fine pin dot quilter’s cotton for the border instead. And although it’s different to the book project, I was still really happy with how it turned out. I’m especially loving the placemat shape. It made a nice change from the traditional rectangle, that’s for sure! The whole project stitched up beautifully in Liberty fabric and Aurifil thread. So next I’ll need to make the matching coaster. There are instructions in Happy Hexies to make pouches and pillows and a mini quilt. But I’m also excited about the tea cozy, mini tote bag and hexie purse too! I’m not sure which pattern I’ll try next! 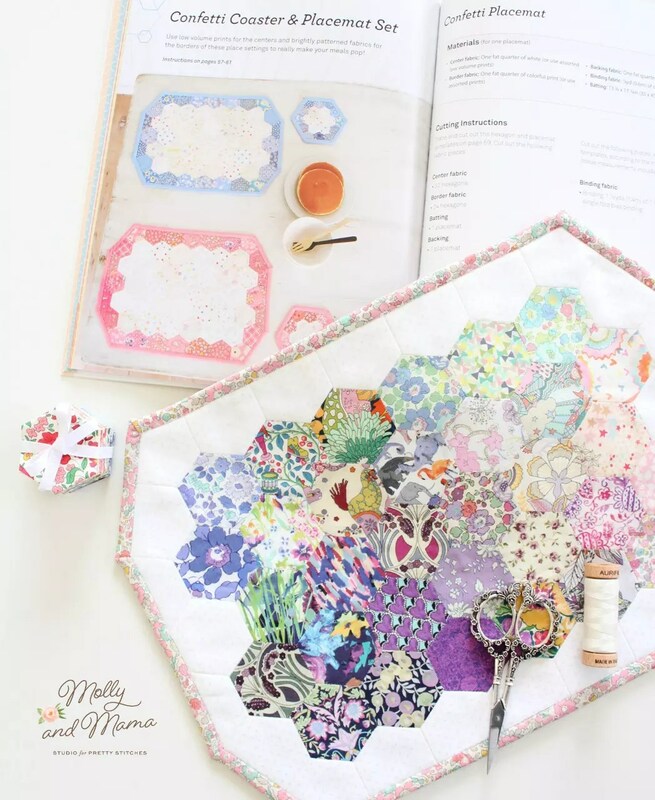 What do you love most about English paper piecing and hexie sewing? Leave a comment below for your chance to win. And then head to the Molly and Mama instagram post to gain an additional entry. EDIT – 20th July, 2017 at 9.15pm AEST -THIS GIVEAWAY IS NOW CLOSED. Warmest congratulations to Carina whose reply on July 18, 2017 at 8:41 am was selected as the winning comment! The best answer will be chosen from the comments here, and the entries on the Instagram post, and the winner will be announced on this blog post after the competition closes. Entries close on Thursday, the 20th of July, 2017 at 9pm Australian Eastern Standard Time (GMT +10). 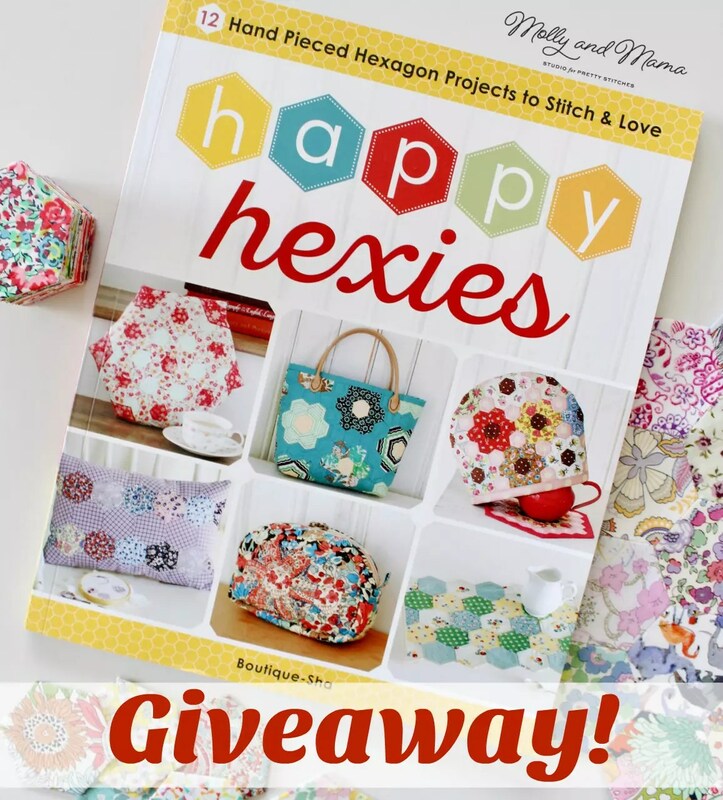 The winner will be notified via Email or Instagram direct message and will be required to provide a mailing address to receive the prize – a copy of Happy Hexies book from Zakka Workshop. One comment per person is permitted on this blog post. To gain an additional entry to the competition, you may enter on the Molly and Mama Instagram account. I absolutely love sewing hexagons, so much so that currently I am making a queen size quilt all made with hexagons. I’ve been working on it, on and off, for 2 years now. Each flower cluster has 6 hexagon petals and 1 center, so you see I have a very big project ahead of me. What I love about this process of sewing/quilt making is I cut out my own paper templates and the process of hand basting first, then the sewing of each hexy together with other colors and before you know it you see a flower cluster come to life. Love it! Sewing hexies makes me feel content knowing I’m creating and chillaxing at the same time. Sewing hexies make me feel….like a REAL sewist. I enjoy hand stitching them together and accomplishing a gorgeous pattern, no electricity required, anywhere, anytime . Sewing hexies makes me feel happy!! Sewing hexis makes me feel…like I’ve stepped back in time to my childhood, and I am stitching with my Grandma, with her loving hands guiding me through learning something new! sewing hexies makes me feel content! Love all your projects! I haven’t done hexagons, but learning is a good thing! Would LOVE a copy of your beautiful book!!! …happy, creative, industrious and relaxed. I can sit and make them all day, in every sort of pretty fabric, and I love admiring them all lined up in my Hexie Box. Looks easy enough to teach the grandaughters some hand sewing. I can’t finish the sentence because I’ve never made a hexie. Definitely on my bucket list!! Sewing hexies makes me feel happy, happy, happy. Happy because I really enjoy it. Happy because it is easily the most relaxing way to sew. Happy because it uses up scraps and is economical while producing beautiful results. Sewing hexes makes me feel like I’ve escaped to my own private island 🌴 to relax, clear my mind, & be peaceful. So relaxing!!! The endless design possibilities and the organic structures is what I like most about this whole process. And that cute little prints can be used! Sewing hexies makes me feel so comfortable, down to earth, very relaxing, just quilters heaven! Sewing hexes makes me feel at peace. I’m only new to EPP but I just love the way I can make tiny pictures when the fabric is fussy cut! There is also something about the way the shapes tessellate so well – it feels like you are putting together something so precise, which is easier in EPP than with normal patchwork and piecing – for me anyway! They are just a really great way to add something to a project too, without a lot of fuss and bother! I also love the history behind EPP and found it funny that there are quilts from way back when that still have their newspaper pieces in them! Did the makers never finish their quilts or did they sleep with newspaper rustling in between the layers!? Like being in Hexie heaven. The color arrangement and their design makes me feel inspired from start to finish! It amazes me how paper piecing can create beautiful pictures by sewing on the paper side and turning it over to see what you’ve created. Hexies are an added attraction. Sewing hexies by hand gives me a feeling of satisfaction that little by little a project comes together no matter where I take my little bag of pieces. a stepping stone to a mosaic in fabric. 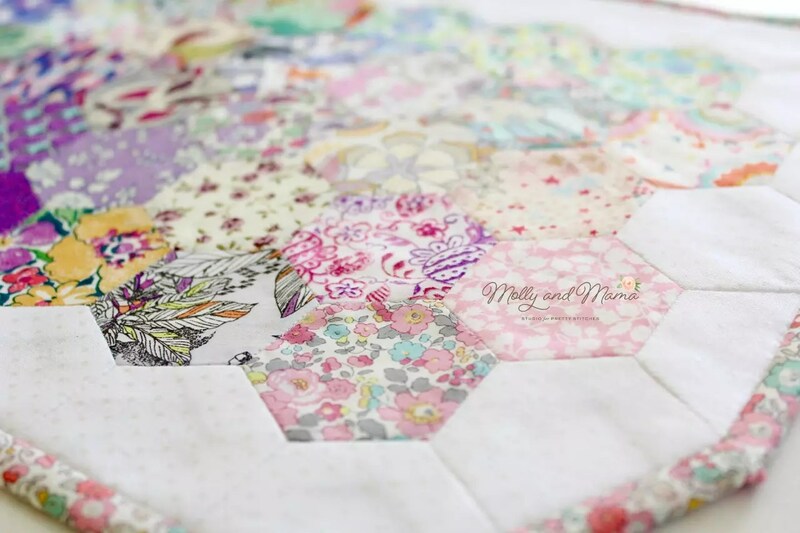 Hexies make me feel so happy … I love their shape, I love sewing them, I love seeing what everyone else sews with them! They remind me of bees and honey …. which I love! And sewing them is the best way to unwind – even if I only manage a small seam or two, I get a sense of satisfaction and calm. Sewing hexies make me feel invincible! If I can hand sew all those tiny pieces into a beautiful thing…well, I can do anything…right? Hexies just make me smile! They’re so sweet and easy to take along and work on wherever! This looks like a fun book, thanks for sharing. Sewing hexies makes me feel creative. Sewing heroes makes me feel curios! I’ve been very curious as to how hexies are made. Have not attempted yet. The book sounds like it would knock me off the fence and get me started. Sewing with Hexies makes me feel nostalgic. I have a quilt top that was made by a family member in the early 1900’s. It is beautiful and my hope is that this book could inspire me to finish what my ancestor began. I love the way EPP takes me back to my grandmothers old boarding house and spending time with her out in her garden. Stitching hexies is “sew” relaxing. Fabulous ideas in this new book! Sewing hexies makes me feel happy, creative, content, and relaxed. It doesn’t get any better than that. Thank you for this great giveaway! Have a super great hexie day! Sewing hexies makes me feel calm and connected. The entire hexie process is so much fun. Thanks for the chance to win a beautiful book. My favorite things about hexies are how portable they are and how versatile they are. Sewing hexies is frustrating to me! Need all the help and inspiration I can get! Me, me, me! I would love to win this! Sewing hexes makes me feel like I am truly creating something with my own fair hands, no gadgets, gimmicks or technology needed. A little bit of bliss : ) Thank you for the giveaway opportunity, the book looks lovely. Sewing hexis make me fill happy!! Sewing hexies is fun fabulous fantastic! A big thank you to all the lovely people who left a comment on this blog post and/or on instagram to win this beautiful book from Zakka Workshop, ‘Happy Hexies’. I’ve enjoyed reading all of your comments and happy stories immensely. They’ve certainly brightened my day, so I encourage you to read the responses of others. They’ll bring a smile to your face! Warmest congratulations to Carina whose reply on July 18, 2017 at 8:41 am was selected as the winning comment! I will be in touch to arrange delivery of your prize. Many thanks to everyone for supporting Molly and Mama, my blog and little biz. It means the world to me.